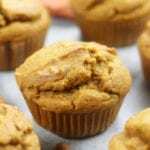 So completely heavenly, moist and fluffy, these Pumpkin Spice Muffins are healthy enough for breakfast and scrumptious enough for dessert. Such a family favorite! Preheat oven to 350℉ and line a 12 cup muffin pan with muffin liners. Cream together wet ingredients. In a separate medium sized bowl sift together dry ingredients. Incorporate dry ingredients into wet ingredients, mixing until just incorporated. Using a 1/4 cup measuring cup divide batter among muffins cups. Bake for 25-30 minutes or until toothpick inserted in center comes out clean and muffin springs back to the touch.